We are a community-organized, grass-roots, not-for-profit, all volunteer event, organized in 2012, to bring people together to enjoy live, local music and poetry. We gather once a month, on the first Saturday from 7 – 10:00 pm. The setting is warm and inviting, with seating around candle-lit, café style tables covered with woodblock print tablecloths. We offer coffee, tea, and seltzer while volunteers bring a variety of baked and savory foods, contributing to the relaxed environment, inviting people to come in and socialize. We rely on donations at the door to meet expenses, and attract 20 - 70 patrons on a given night. Musicians comment on the surprisingly good acoustics and the attentive crowd. For musicians, it is a joy to play in a venue without competing background noise. The normal format for an evening is Open Mic from 7 - 8 pm, Featured Act from 8 - 9:15, and more Open Mic or Song Swap until closing. We are members of the Northwest CT Arts Council and we have featured hundreds of talented musicians and songwriters with a wide variety of styles from folk, blues, jazz, bluegrass, Irish & British Isles, percussion, and Americana to gospel. During Open Mic people from the community are encouraged to sign up to share their talents. 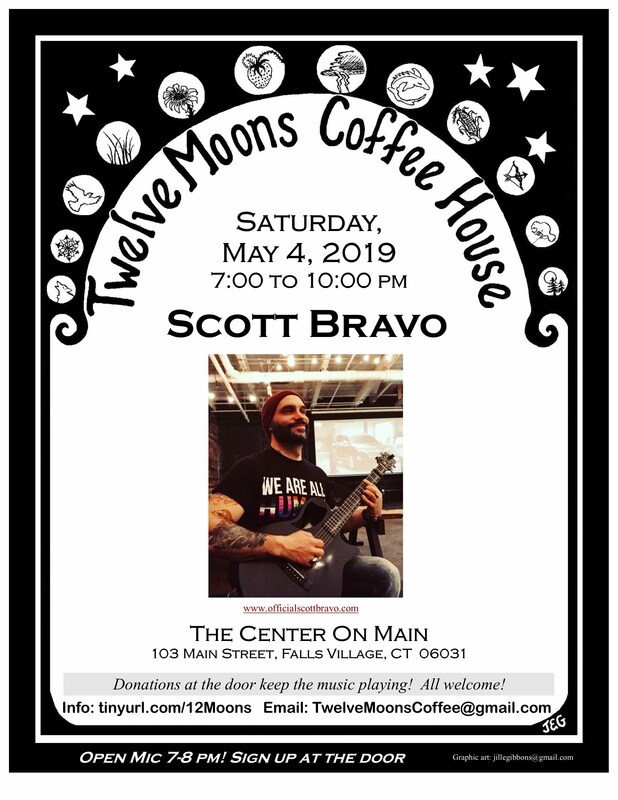 What makes Twelve Moons Coffee House special is the warm, inviting atmosphere, where organizers have worked hard to create an environment where everyone is welcome and feels comfortable taking a chance sharing their best talents. Whether it’s singing or poetry, setting up tables or baking goodies, everyone’s contributions are appreciated and valued. We are currently working on expanding our volunteer base, which has dwindled during the past few years due to health and aging. Let us know if you're interested in joining our team! service, community and friendship. All are welcome.